KARACHI: After the first export consignment of fish to European Union (EU) was cleared, now another three containers are on their way to Spain, said officials on Thursday. The maiden consignment of 12 metric tons of cuttlefish was cleared by the EU custom authorities on Wednesday. Initially, the exporter Akhlaq Enterprise obtained health and catch certificates from the Marine Fisheries Department (MFD). This was the first consignment after the EU slapped the ban on fish six years ago. Managing Director MFD Shaukat Hussain said the consignment remained under strict monitoring, control, laboratory analysis and inspection by the department since the purchasing by the company from an approved site at the Karachi Fish Harbour. He said the MFD has sent the names of three companies to EU. 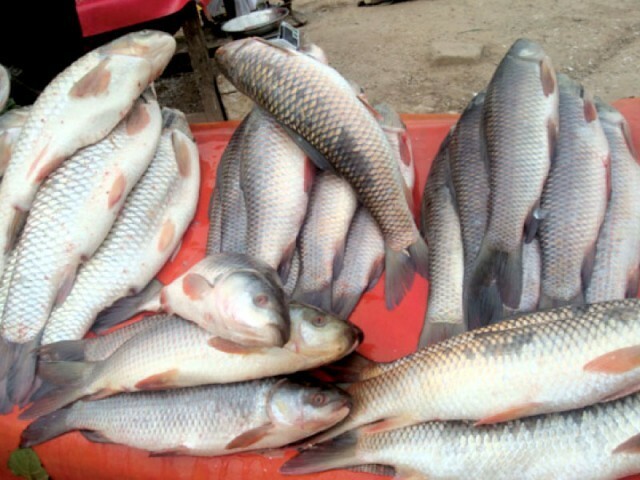 �We hope that these companies will also be allowed to export fish to the block,� he added. �We are in the process of removing all discrepancies to revive seafood exports to EU countries and Pakistan�s fish exports can reach to $100 million,� he said. The total seafood exports for the fiscal 2012-13 stood at $317 million as against $331 million in the 2011-12. Hussain said if exports to EU resume the seafood exports will go above $400 million. The sea food exporters are interested in the complete lift of EU ban since the price in the block is better than that in other Asian markets. Hussain said local exporters are presently catering to Chinese market. However, it�s a fluctuating market and the exports go up and down. EU is a stable market, he added. He said MFD has led EU delegation to Gwadar Fish Harbour, Gaddani Fish Harbour, Pasni Fish harbour, and Korangi Fish harbour. EU has shown interest in importing fish from these harbours provided that the EU standards are met. MFD is working to bring harbours at par with the international standards. On April 12, 2007, after the EU inspection mission nine establishments were delisted by the EU. MFD tackled the problem effectively for resumption of export to the EU and all the deficiencies at 13 areas have been removed successfully. As a result, on the evidences submitted by MFD, the export from two companies Akhlaq Enterprise and AG Fisheries was allowed by European Commission in February 2013. He said that federal government modified three local boats as modular boats at a total cost of Rs5 million. Now, there are more than 900 modified boats. This is a success story for Pakistan. Besides, a comprehensive traceability system has been established and guidelines on Food Safety and Hazard Analysis and Critical Control Point (HACCP) have been developed. Training and development of fishermen and other stakeholders on food safety is a regular activity being undertaken by the MFD. The testing laboratories have achieved accreditation under international standards and test reports from these two MFD laboratories � micro biology lab and chemical lab � are acceptable worldwide. General awareness of food safety requirements have been developed among the stake holders. MFD is very strict in inspection, monitoring and certification. This will help 100 percent compliance of EU/national standards by food business operators, said MD MFD. He said local catch is being smuggled. The issue is more severe in Khyber Pakhtunkhwa. Fresh water catch is being smuggled to Afghanistan and from Balochistan it is being smuggled to Iran, which needs to be stopped.